This collection of quotations is copyrighted as a whole, but, of course, individual quotations are not. 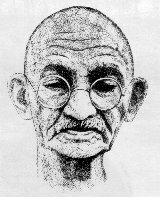 Mahatma Gandhi (1869-10-02 1948-01-30 age:78) lead India to independence using non-violent means. 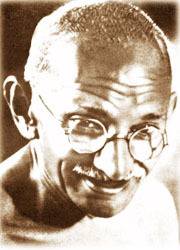 Indians refer to him as Mahatma Gandhi which means great soul. Martin Luther King later used these same techniques to fight for black civil rights in the USA. I have always felt a special kinship with Gandhi. He was assassinated on 1948-01-30 by a Hindu fanatic. As he was dying he blessed his assassin. I was born five days later, just missing any chance to even hear him on the radio. Gandhi inspired Martin Luther King. And King in turn inspired me in my work with gay liberation in the 1970s. When I started, 95% of the gays were against me and 100% of the straights. I figured it was pointless, but I wanted to make a token gesture of defiance anyway. In only two years we had the first gay rights legislation. When I went to India in 1985 I met Gandhi’s godson, a wealthy industrialist who owned an automobile, washing machine,… manufacturing company called Tata He told me what it was like as a boy living with Gandhi. Later he let me spend an afternoon in his private museum of Gandhi memorabilia. On that trip a woman gave me an uncopyrighted little book called Quotes of Gandhi . Here I share with you from that book and other sources. I find Gandhi’s and King’s obsession with God somewhat embarrassing. However, that belief was central to their thinking, so I don’t censor it here. For me the present is merged in eternity. I may not sacrifice the latter for the present. Consciously or unconsciously, everyone of us does render some service or another. If we cultivate the habit of doing this service deliberately, our desire for service will steadily grow stronger and it will make not only for our own happiness, but that of the world at large. I claim to be an average man of less than average ability. I have not the shadow of a doubt that any man or woman can achieve what I have, if he or she would make the same effort and cultivate the same hope and faith. I claim to be no more than an average person with less than average ability. I have not the shadow of doubt that any man or woman can achieve what I have, if he or she would make the same effort and cultivate the same hope and faith. If we are to teach real peace in this world and if we are to carry on a real war against war, we shall have to begin with the children. Service that is rendered without joy helps neither the servant nor the served. But all other pleasures as possessions pale into nothingness before service which is rendered in a spirit of joy. A true soldier does not argue as he marches, how success is going to be ultimately achieved. But he is confident that if he only plays his humble part well, somehow or other the battle will be won. In is that spirit that every one of us should act. It is not given to us to know the future. But it is given to everyone of us to know how to do our own part well. Truth quenches untruth, love quenches anger, self-suffering quenches violence. This eternal rule is a rule not for saints only but for all. Even as wisdom often comes from the mouths of babes, so does it often come from the mouths of old people. The golden rule is to test everything in the light of reason and experience, no matter from where it comes. Abstract truth has no value unless it incarnates in human beings who represent it, by proving their readiness to die for it. He who trifles with truth cuts at the root of Ahimsa [non-violence]. He who is angry is guilty of Himsa. Breach of promise is no less an act of insolvency than a refusal to pay one’s debt. Confession of errors is like a broom which sweeps away the dirt and leaves the surface brighter and clearer. I feel stronger for the confession. However, much I may sympathise with and admire worthy motives, I am an uncompromising opponent of violent methods even to serve the noblest of causes. Nonviolence is not a garment to be put on and off at will. Its seat is in the heart and it must be an inseparable part of our being. Experience convinces me that permanent good can never be the outcome of untruth & violence. Even if my belief is a fond delusion, it will be admitted that it is a fascinating delusion. Violent men have not be known in history to die to a man. They die up to a point. Non-violence is not a quality to be evolved or expressed to order. It is an inward growth depending for sustenance upon intense individual effort. To my mind, the life of a lamb is no less precious than that of a human being. The more helpless the creature, the more that it is entitled to protection by man from the cruelty of man. A No uttered from the deepest conviction is better than a Yes merely uttered to please, or worse, to avoid trouble. It is any day better to stand erect with a broken and bandaged head than to crawl on one’s belly, in order to be able to save one’s head. Real suffering bravely borne, melts even a heart of stone. Such is the potency of suffering. And there lies the key to Satyagraha. It is unwise to be too sure one’s own wisdom. It is healthy to be reminded that the strongest might weaken and the wisest might err. I am but a poor struggling soul yearning to be wholly good, wholly truthful and wholly non-violent in thought, word and deed, but ever failing to reach the ideal which I know to be true. It is a painful climb, but the pain of it is a positive pleasure to me. Each step upwards makes me feel stronger and fit for the next. My work will be finished if I succeed in carrying conviction to the human family that every man or woman, however weak in body, is the guardian of his or her self-respect and liberty and that this defence prevails though the world be against the individual resister. A principle is the expression of perfection and as imperfect beings like us cannot practice perfection, we devise every moment limits of its compromise in practice. There are times when you have to obey a call which is the highest of all, i.e. the voice of conscience even though such obedience may cost many a bitter tear and even more, separation from friends, from family, from the state, to which you may belong, from all that you have held as dear as life itself. For this obedience is the law of our being. Don’t listen to friends when the Friend inside you says Do this. I do not want to forsee the future. I am concerned with taking care of the present. God has given me no control over the moment following. I have always thought that having wealth flow to you without doing something of equal value in return was a form of theft. Most Americans hold a quite different view. They believe that people like Romney to whom money flows effortlessly like a supermagnet, who provide no goods or services to those who give them the money, who then spend that wealth as wastefully and conspicuously as possible, represent the very goal of existence. Nearly everyone who gets rich does it by short-changing, or even actively harming, their fellows, hardly admirable behaviour. Man and his deed are two distinct things. Whereas a good deed should call forth approbation and a wicked deed dis-approbation, the doer of the deed, whether good or wicked always deserves respect or pity as the case may be. Hate the sin and not the sinner is a precept which though easy enough to understand is rarely practised and that is why the poison of hatred spreads in the world. Man has reason, discrimination and free-will such as it is. The brute has no such thing. It is not a free agent, and knows no distinction between virtue and vice, good and evil. Man, being a free agent, knows these distinctions, and when he follows his higher nature, shows himself far superior to the brute, but when he follows his baser nature can show himself lower than the brute. Woman in the companion of man, gifted with equal mental capacities. She has the right to participate in the minutest details in the activities of man and she has equal right to liberty of freedom and liberty with him. It is the law of love that rules mankind. Had violence, i.e. hate, rules us we would have become extinct long ago. And yet, the tragedy of it is that the so-called civilised men and nations conduct themselves as if the basis of society was violence. Hatred ever kills, Love never dies, such is the vast difference between the two. What is ordained by love is retained for all time. What is obtained by hatred proves a burden in reality, for it increases hatred. The test of friendship is assistance in adversity and that too, unconditional assistance, Co-operation which needs consideration is as a commercial contract and not friendship. Conditional co-operation is like adulterated cement which does not bind. Friendship that insists on agreement on all matters is not worth the name. Friendship to be real must ever sustain the weight of honest differences, however, sharp they be. God forbid that India should ever take to industrialism after the manner of the west… keeping the world in chains. If [our nation] took to similar economic exploitation, it would strip the world bare like locusts. Golden fetters are no less galling to a self-respecting man that iron ones; the sting lies in the fetters, not in the metal. To see the universal and all-pervading Spirit of Truth face to face one must be able to love the meanest of creation as oneself. And a man who aspires after that cannot afford to keep out of any field of life. That is why my devotion to Truth has drawn me into the field of politics; and I can say without the slightest hesitation and yet in all humility, that those who say that religion has nothing to do with politics do not know what religion means. Just as a man would not cherish living in a body other than his own, so do nations not like to live under other nations, however, noble and great the latter my be. It would conduce to national progress and save a great deal of time and trouble if we cultivated the habit of never supporting the resolutions either by speaking or voting for them if we had not either the intention or the ability to carry them out. What is a war criminal? Was not war itself a crime against God and humanity and, therefore, were not all those who sanctioned, engineered and conducted wars, war criminals? War criminals are not confined to the Axis Powers alone. Roosevelt and Churchill are no less war criminals than Hitler and Mussolini. England, America and Russia have all of them got their hands dyed more or less red — not merely Germany and Japan. I do not want my house to be walled in on all sides and my windows to be stuffed. I want the cultures of all the lands to be blown about my house as freely as possible. But I refuse to be blown off my feet by any. I refuse to live in other people’s houses as an interloper, a beggar or a slave. Measures must always in a progressive society be held superior to men, who are after all imperfect instruments, working for their fulfillment. This campaign of non-cooperation has no reference to diplomacy, secret or open. The only diplomacy it admits of is the statement and pursuance of truth at any cost. Man becomes great exactly in the degree in which he works for the welfare of his fellow men. An opponent is entitled to the same regard for his principles as we would expect others to have for ours. Non-violence demands that we should see every opportunity to win over opponents. Indeed one’s faith in one’s plans and methods is truly tested when the horizon before one is the blackest. Non-cooperation is an attempt to awaken the masses, to a sense of their dignity and power. This can only be done by enabling them to realise that they need not fear brute force, if they but know the soul within. Non-cooperation is beyond the reach of the bayonet. It has found an abiding place in the Indian heart. Workers like me will go when the hour has struck, but non-cooperation will remain. Non-cooperation is directed not against men but against measures. It is not directed against the Governors, but against the system they administer. The roots of non-cooperation lies not in hatred but in justice if not in love. If we want to cultivate a true spirit of democracy we cannot afford to be intolerant. Intolerance betrays want of faith in one’s cause. Moral authority is never retained by any attempt to hold onto it. It comes without seeking and is retained without effort. It is quite proper to resist and attack a system, but to resist and attack its author is tantamount to resisting and attacking oneself, for we are all tarred with the same brush and are children of one and the same Creator and as such the divine powers within us are infinite. To slight a single human being, is to slight those divine powers and thus to harm not only that Being, but with Him, the whole world. I believe that cunning is not only morally wrong but also politically expedient and have therefore always discountenanced its use even from the practical standpoint. The only virtue I want to claim is truth and non-violence. I lay no claim to super-human powers. I want none. I wear the same corruptible flesh that the weakest of my fellow beings wears and am therefore as liable to err as any. My services have many limitations, but God has up to now blessed them in spite of the imperfections. The first condition of humaneness is a little humility and a little diffidence about the correctness of one’s conduct and a little receptiveness. It is man’s social nature which distinguishes him from the brute creation. If it is his privilege to be independent, it is equally his duty to be inter-dependent. Only an arrogant man will claim to be independent of everybody else and be self-contained. Man falls from the pursuit of the ideal of plain living and high thinking the moment he wants to multiply his daily wants. Man’s happiness really lies in contentment. As a rule, the mind, residing in a body that has become weakened by pampering, is also weak and where there is no strength of mind there can be no strength of soul. I am a Puritan myself, but I am catholic toward others. I would rather see the race of man extinct than that we should become less than beasts by making the noblest of God’s creation, woman, the object of our lust. No sacrifice is worth the name unless it is a joy. Sacrifice and a long face go ill together. Sacrifice is making sacred. He must be a poor specimen of humanity who is in need of sympathy for his sacrifice. There will have to be rigid and iron discipline before we achieve anything great and enduring and that discipline will not come by mere academic argument and appeal to reason and logic. Discipline is learnt in the school of adversity. In the attitude of silence the soul finds the path in a clearer light and what is elusive and deceptive resolves itself into crystal clearness. Our life is a long and arduous quest after Truth. It is easy enough to say, I do not believe in God. For God permits all things to be said of Him with impunity. he looks at our acts. And any breach of His Law carries with it, not its vindictive, but it purifying, compelling punishment. Human society is a ceaseless growth and unfoldment in terms of spirituality. Perfection is the exclusive attribute of God and it is indescribable, untranslatable. I do believe that it is possible for human beings to become perfect, even as God is perfect. It is necessary for all of us to aspire after that perfection but when that blessed state is attained, it become indescribable, indefinable. I do not want any patronage, as I do not give any. I am a lover of my own liberty and so I would do nothing to restrict yours. I simply want to please my own conscience which is God. Constant development is the law of life and a man who always tries to maintain his dogmas in order to appear consistent drives himself into a false position. The world is touched by sacrifice. It does not then discriminate about the merits of a cause. No so God — He is all seeing. He insists on the purity of the cause and on adequate sacrifice thereof. There is nothing that wastes the body like worry and one who has any faith in God should be ashamed to worry about anything whatsoever. Prayer is not asking. It is a longing of the soul. It is daily admission of one’s weakness… It is better in prayer to have a heart without words than words without a heart.